So, the Meyer lemon tree at my parents’ house bore one (1) lemon, which has gradually been ripening for some time. Honestly, to do a good job with citrus, you ought to have a good, bright spotlight for it in the winter, which my parents don’t, so actually even one lemon is actually pretty good. But what to do with a single Meyer lemon? Of course Meyer lemons are a cross between oranges and lemons, so the fruit are substantially bigger than regular lemons. Juicier, too. I decided a single Meyer lemon would do fine to make a recipe of lemon curd. Combine the zest, juice, butter, and sugar in the top of a double boiler over hot but not boiling water. Stir occasionally as the butter melts. Meanwhile, beat the eggs in a separate bowl. When the butter is melted, drizzle about 1/4 C of the hot lemon mixture into the eggs while you continue beating the eggs. Cunningham just says “spoon a little of the hot lemon mixture into the eggs,” so let me be specific: 1/4 C worked fine. Now pour the eggs into the lemon mixture in the top of the double boiler, whisking constantly. Continue whisking until the lemon curd thickens. Cunningham warns that this can take up to 20 minutes. No doubt that’s true, but I found the curd was quite thick after ten minutes. Remove from heat, pour into a cool dish, cool, and chill. Raspberry sauce makes such a difference to the appearance of the parfaits, and after all, raspberries and lemon go great together. Plus we have lots of raspberries in the freezer from last year. So actually we grew the raspberries AND the lemon. I guess if we had cows we could go all the way and make cream, too, but not likely. Anyway, to make these, obviously you just beat a cup of chilled cream with 1/4 C of sugar until stiff. The raspberry sauce was made with a couple cups of frozen raspberries and sugar to taste; just cook until you have a nice puree and then chill. 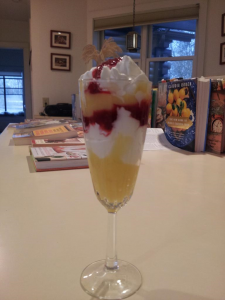 To assemble, spoon first lemon curd and then whipped cream and then a little raspberry sauce into the stemmed glasses and repeat. There you go, elegant parfaits that, if not exactly quick what with making and chilling the lemon curd and raspberry sauce, can at least be made and assembled ahead of time.